SSIS (SQL Server Integration Services) is an ETL tool, provided by Microsoft, for effectively managing data loading in enterprise-level Data warehouses. It provides various types of source and destination adapters for synchronizing data among heterogeneous data sources. 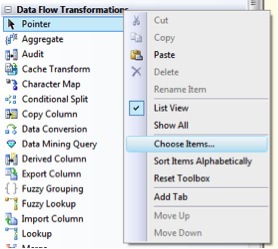 Many inbuilt transformation components are also available for data manipulation and data streaming in the Dataflow task, although sometimes these transformations seem to be insufficient in transforming data as per business requirements. 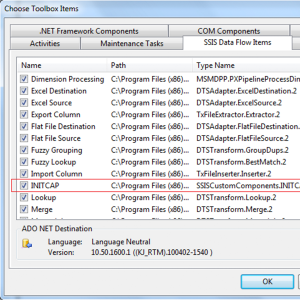 In such cases, .Net code can be integrated in SSIS using Scripts Component. The challenge comes when you require such functionality in many SSIS packages, because then managing and manipulation of .Net code becomes difficult. SSIS Custom Component written in .Net comes in handy for developers to overcome such situations. Let’s start with this interesting journey. This example is using SQL Server 2008 R2 and .Net 3.5 framework on 64-bit windows environment. If you have a different environment, setting a system of executable and referencing libraries will be changed accordingly. The solution is also available on GitHub here. 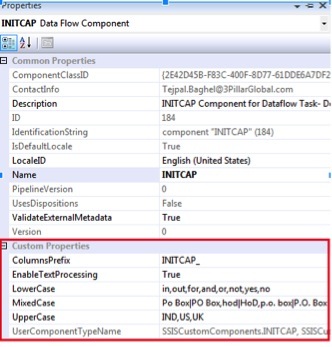 , Description = "INITCAP Component for Dataflow Task- Developed by Tejpal Baghel"
This method will execute when this component is added to a data flow task as design time. The inputs, outputs, and custom properties of this component are defined by this method. Exceptional text processing can be controlled using the “EnableTextProcessing” property, set to either true or false. If this property value is set to true, then exceptional text processing will be applied as per values assigned to “UpperCase,” “LowerCase,” and “MixedCase” custom properties. This is a user-defined centralized and reusable method for fire error/exceptions entry in a log pipeline. 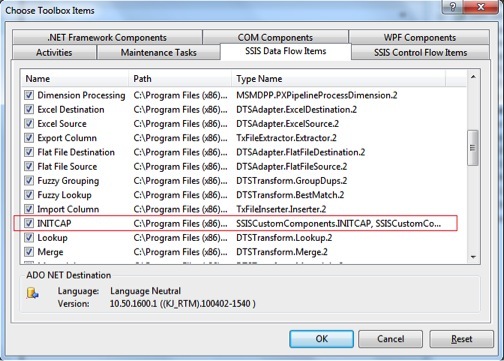 The Validate method will execute repeatedly when a component is edited for verification of the component’s configuration in SSIS designer at design time. DTSValidationStatus enum provides information of configuration status. New columns should be added in the output stream and named to INITCAP_<Column Name>. The value of <Column Name> will extract from the input stream, while the “ColumnsPrefix” custom property provides initial value and the default value is INITCAP_. The ReinitializeMetaData method will execute in response to the component returning VS_NEEDSNEWMETADATA from the Validate method. This prevents users from adding a new output column using the advanced editor. This is done because the component has already added an output column in the Validate method. This executes once at runtime prior to starting the execution. This is the most usable method; it will execute repeatedly as the data flow task receives full buffers from the upstream components. Because this component is synchronous, the incoming rows will be added to the output stream at the same time. The method for “Proper Case” text processing will execute for every row in this method. The EndOfRowset property will be used for the identify end of the input data stream. This is a user-defined method for text processing. Incoming text data will process and prepare the output text in “Proper Case” as required. This function executes another function, “Exceptional_TextProcessing,” for handling exceptional cases during text processing, but only if the component property “EnableTextProcessing” value is set to true. The steps for using custom components in the SSIS package are given below. The sample package is designed for generating output text data in “Proper Case” (INITCAP). 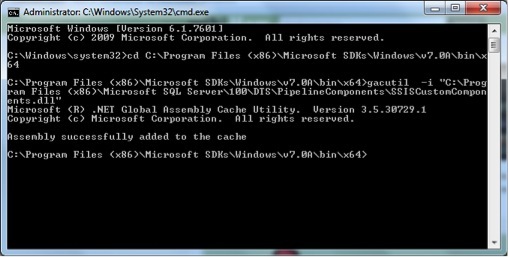 Execute the package and verify the result in the output file. 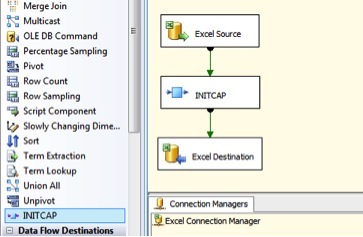 A quick look at the data formatting using the INITCAP transformation captured by the data viewer is shown below. 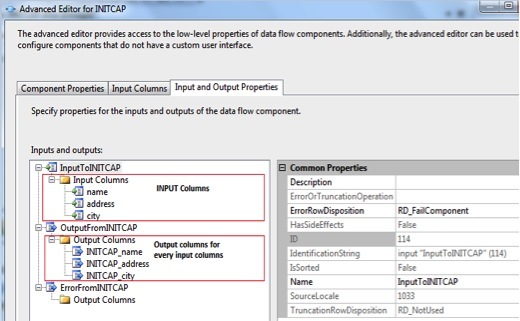 INITCAP_Name, INITCAP_Address, and INITCAP_City are the output columns created by this transformation, based on the Name, Address, and City columns respectively. The data in the output columns are produced in initial caps locl (“Proper Case”). This article demonstrates all of the steps for the development, configuration, and usability of a solution-oriented custom component written in .Net for an enterprise-level SSIS solution. Although this is a basic example to start with, the SSIS custom component can also be implemented for business-centric requirements. Tejpal Baghel is a Technical Lead working at 3Pillar Global. Tejpal has 8 years of experience in data warehousing and business intelligence solution development using MSBI technology. He has enterprise business intelligence solution development experience in healthcare, financial management, B2B integration and revenue forecasting. Prior to joining 3Pillar, he has worked in Tata Consultancy Services (TCS) and Accretive Health. Tejpal is a graduate in Computer Science from Agra University in India. He is actively involved in social activities and believes in the power of politics for building a better nation.